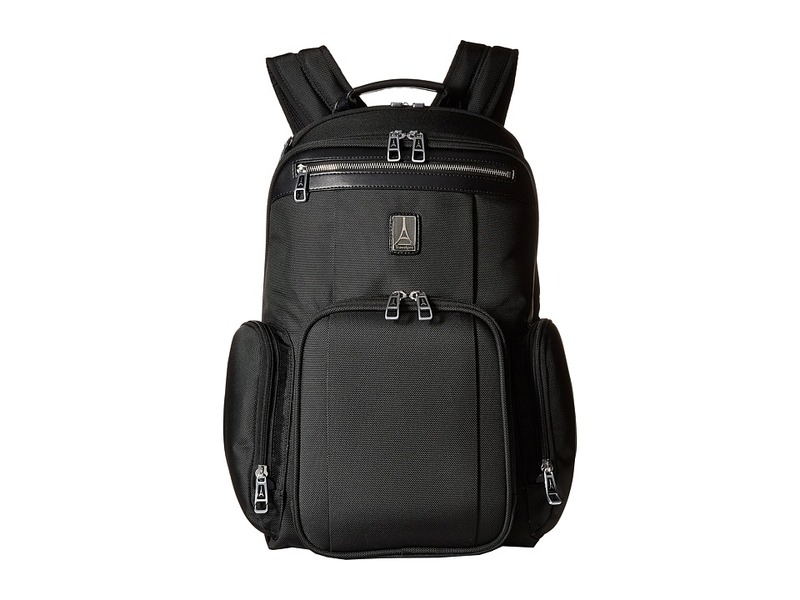 The Platinum Magna 2 - Check Point Friendly Business Backpack has all of the functionality of a backpack, with the added panache that Travelpro is known for. Made with rugged nylon fabric and DuraGuard coating provide exceptional durability and stain resistance. Adjustable, padded shoulder straps, sliding sternum strap and Duraflex buckle technology ensure a comfortable, secure fit. Genuine leather handles and accents for comfort and style. Padded sleeve holds most laptops up to 15.6. This checkpoint friendly feature allows you to pass through security without removing your laptop. Four exterior zippered pockets. SUPRA zipper heads are engineered to resist damage from daily use and abuse. RFID-blocking pocket keeps credit cards and passport hidden to protect against loss and identity theft. Built-in business organizer. Two main compartments feature one tablet pocket, two slip pockets, and one mesh pocket. Imported. Measurements: Width: 14 in Depth: 9 in Height: 18 in Weight: 3 lbs 2.4 oz Proposition 65 WARNING: This product contains chemicals known to the State of California to cause cancer and birth defects or other reproductive harm.